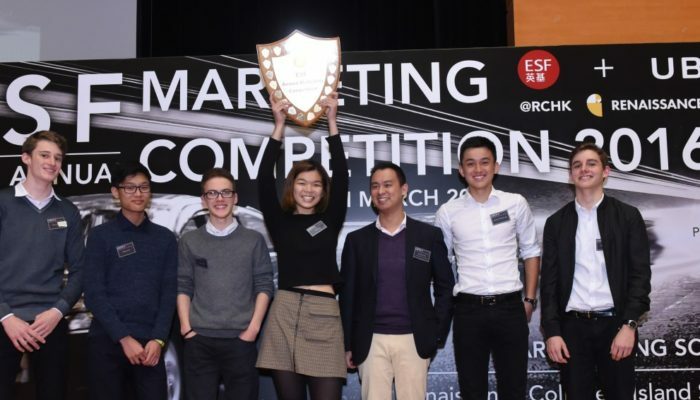 ESF hosted the 10th annual ESF Marketing Competition at Renaissance College (RCHK) on Wednesday, 16 March 2016. This year we are excited to have Uber, one of the most game-changing app-based car-hailing companies in the world, to be our sponsor. Each of the seven participating ESF schools, including Island School, KGV, RCHK, Sha Tin College, South Island School, Discovery College and West Island School, sent two teams of Year 12 students to compete on a variety of marketing-related tasks throughout the day. Island School’s Team 2 reigned supreme, winning HK$500 Uber credits for each teammate along with gift bags from the company. Their strategy is to recruit more female Uber drivers through financial incentive and referral rewards.They believe once female drivers become more comfortable with Uber, their engagement will become a routine. RCHK’s Team 2 came second. Also targeting to capture female drivers, they decided to do it in a different approach. Through a specially designed tiered driver loyalty programme with bonus incentives at each level, such as discounts for child tuition, it is hoped to attract female homemakers returning to work. The annual contest is designed to encourage students to apply their business knowledge and skills to real life.